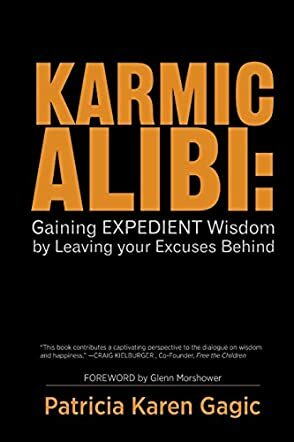 Karmic Alibi: Gaining Expedient Wisdom by Leaving Your Excuses Behind by Patricia Karen Gagic is an insightful book which speaks about the laws of the universe; what we give out, we get back. Positive thoughts attract positive outcomes, and negative thoughts invite negativity into our lives. The book tells us, the readers, how karma is the sum of one's actions and thoughts. Each person has their own individual karma and they don't take anyone else's karma. The author's thoughts are profound and all readers will be motivated by the energy and wisdom she shares. The book will definitely inspire all those readers who are looking to make changes in their lives for the betterment of humanity. The book has tragedy, loss and joy, and teaches one to listen to their intuition and also let their common sense prevail while living their lives. The book can be used as a healing tool for all those readers who are going through turmoil and bad phases in their lives. The author speaks about the importance of choices and how everyone has their choices presented to them in each and every circumstance and relationship in their lives. Everyone can elevate their living by realization, contemplation, visualization and meditation. I found the book useful to look at life with a new perspective and the author's story is inspirational. The author's story will definitely teach readers how to cope, function and co-exist peacefully, attracting more clarity and peace in their lives.